Let me start off by saying: I know... Puff pastry is not a very healthy option for pizza dough. Store bought puff pastry contains high fructose corn syrup and other questionable ingredients but it is easy to use and delicious — flaky and the perfect balance of savory and sweet. I made the decision to use puff pastry for this Potato Pizza mostly because I had an extra sheet lying around, leftover from a special occasion, and was looking for a way to use it up. If you are not interested in using puff pastry, any homemade or store-bought dough or crust will work instead; even whole wheat pocketless pitas make excellent individual pizza crusts. I like to show mainly healthy pure vegetarian dishes on Kitchen La Bohème but I'm definitely not an advocate of never having a treat. Puff pastry is great for special dishes and desserts — the kind you don't eat every day. And while typical homemade puff pastry is not pure veg, Pepperidge Farm puff pastry is. Prepare the puff pastry: Preheat an oven to 400°F. Thaw the puff pastry according to package directions, about 45 minutes. Unfold on a lightly floured surface and roll out to desired thickness. 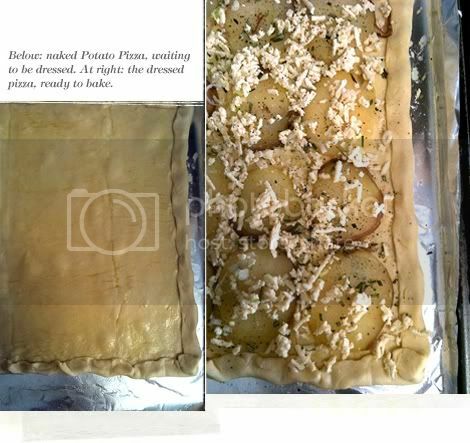 Transfer pastry to a prepared baking sheet (foil sprayed with cooking spray will work just fine if you don't have parchment paper) and fold each edge over to create a crust. Dress your pizza: Brush the prepared pastry with extra virgin olive oil. 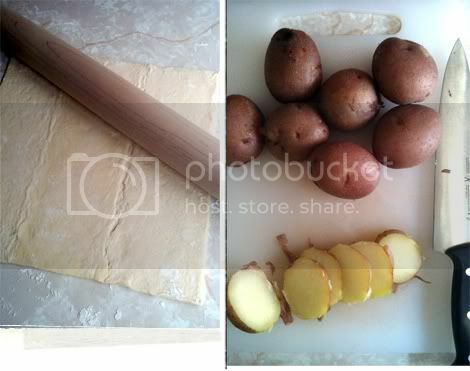 Lay the potato slices in neat rows on the pastry. Sprinkle with chopped scallion, rosemary and Daiya. Finish off with salt and pepper to taste. 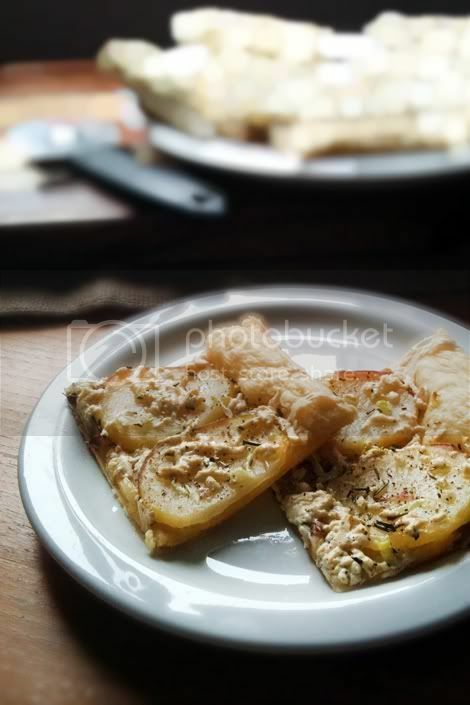 Bake pizza for 15-16 minutes, until crust is golden and crispy, and the Daiya has melted. Remove from the oven and allow to cool for 5-10 minutes. Slice, and serve immediately.